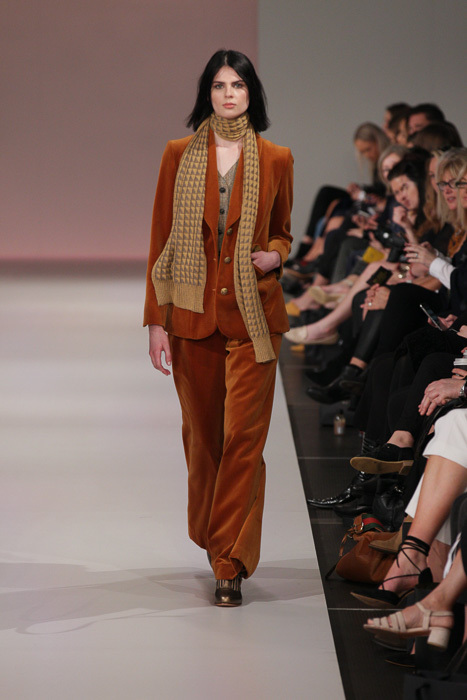 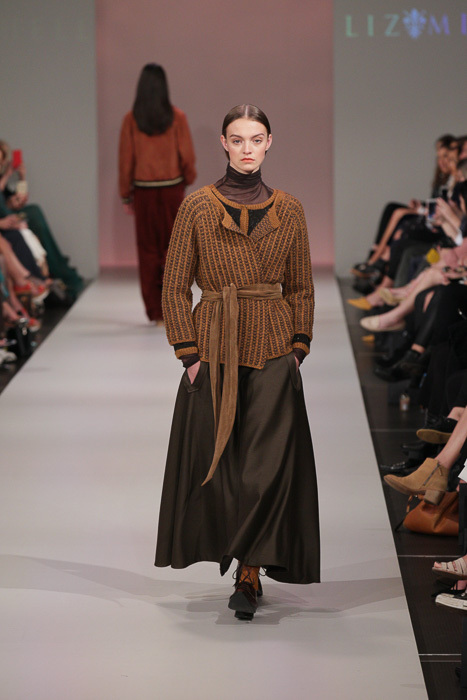 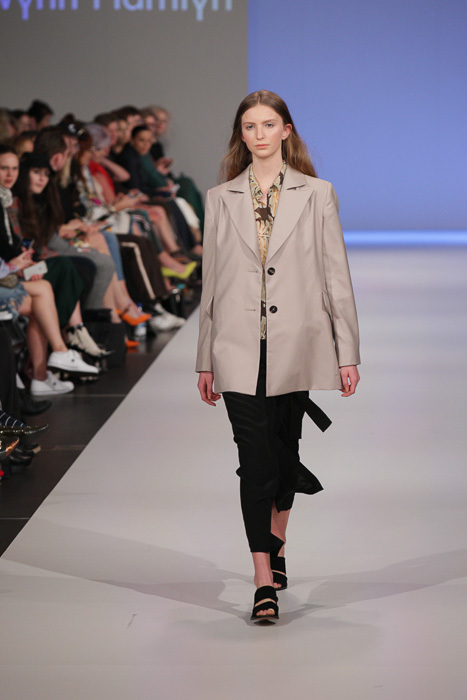 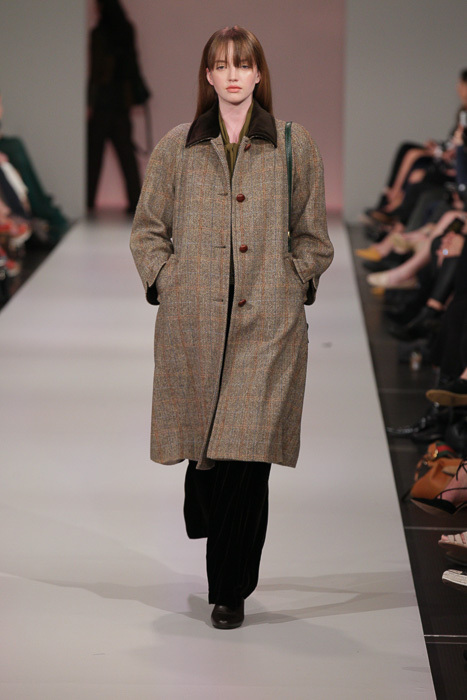 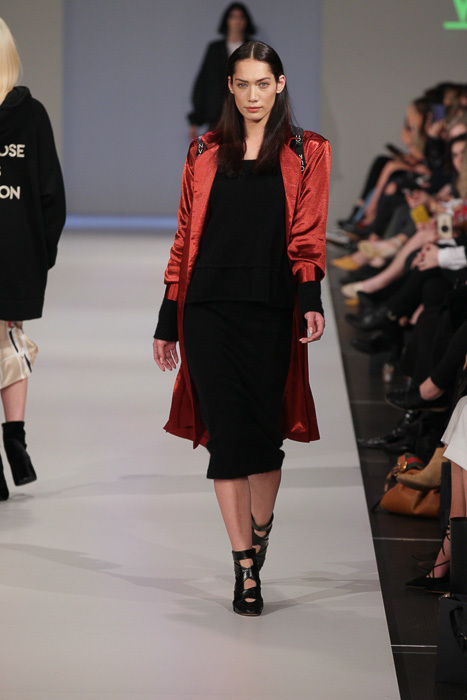 Wynn Hamlyn look at the Wonderful Wool New Zealand Fashion Week 2017 show. 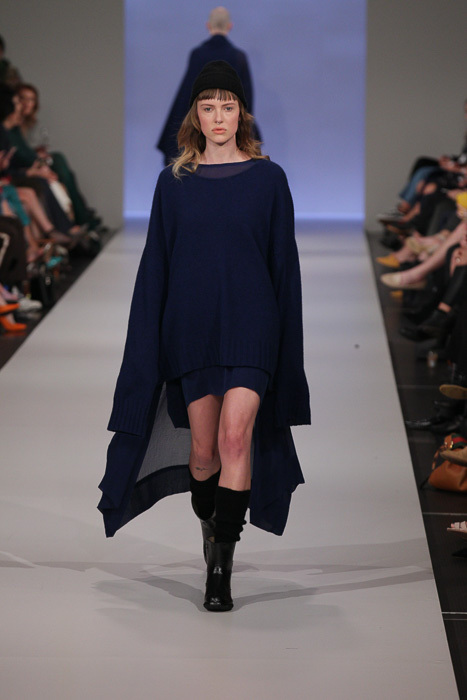 The Wonderful Wool show gathers a selection of top designers showcasing a sample of their collections with pieces made from one of our nation’s greatest exports. 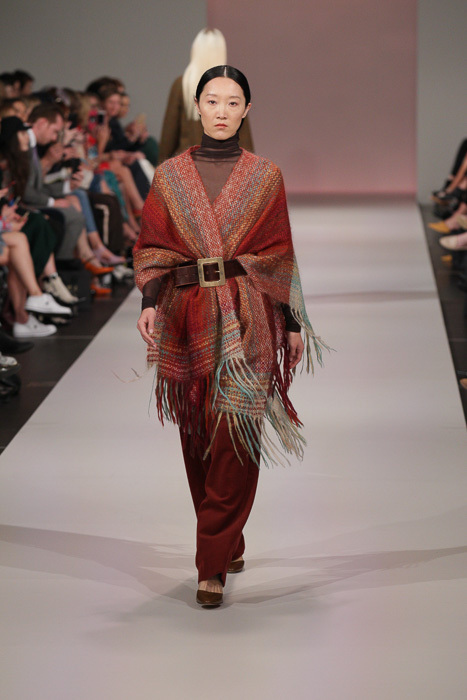 Liz Mitchell- the ambassador for the campaign of wool opened the show, followed by showcases from Lela Jacobs, Wanoa Four and Wynn Hamlyn. 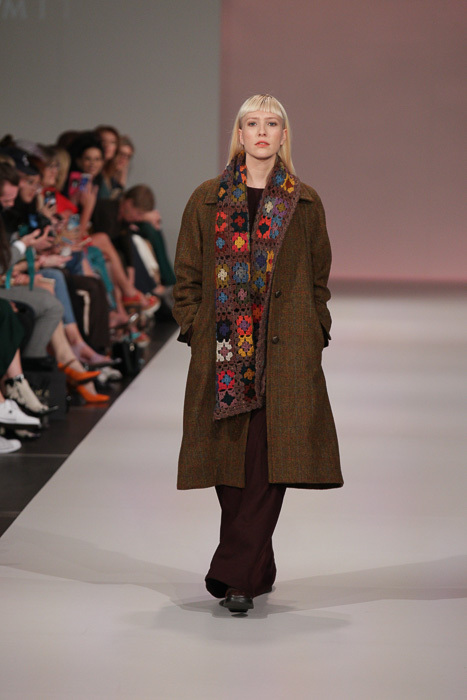 Liz Mitchell’s collection ‘Modern Heritage’ was inspired by the modernist aesthetic of Bloomsbury painter and designer Vanessa Bell as well as the free spirit of Jimi Hendrix. 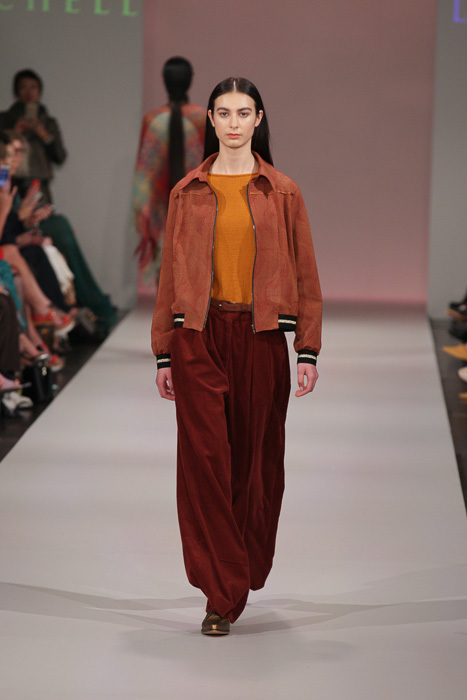 She referenced the artist’s use of colour in her designs and we saw a well-worked palette of chrome yellow, terracotta, ochre, sienna, lichen and aubergine. 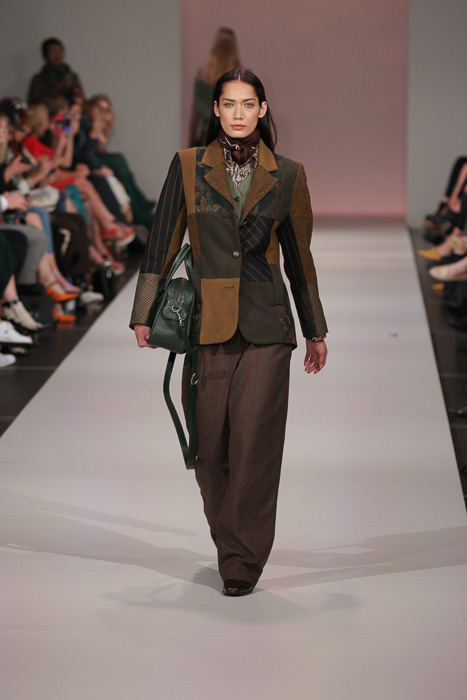 The clothing was classic and sophisticated, an olive hued wool blend tailored coat, paired with wide legged trousers and accessorised with a crochet scarf opened the show. 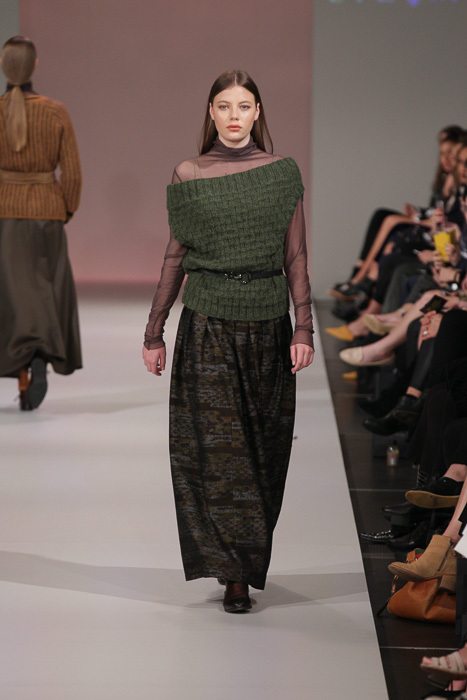 A pairing of chunky knit sweaters worn over mesh tops were matched beautifully with long silk skirts. 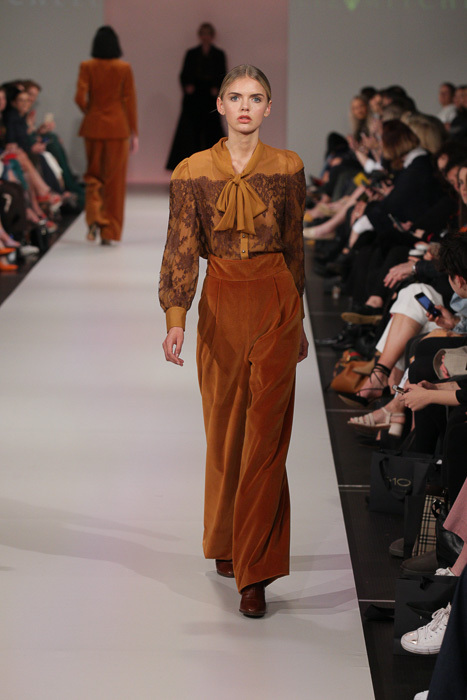 And we saw a velvet trouser suit that was particularly fetching. 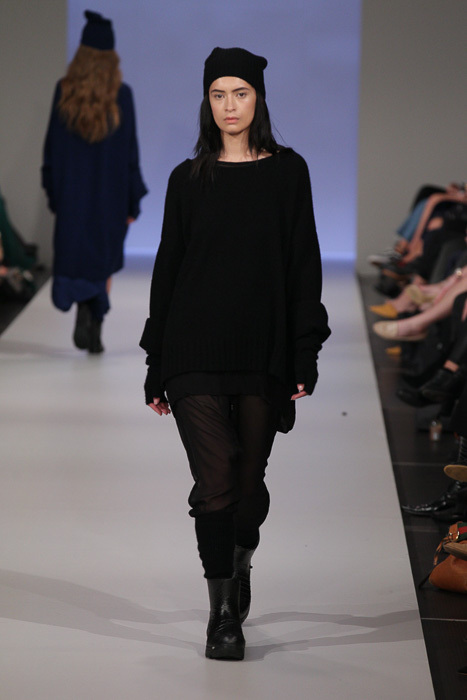 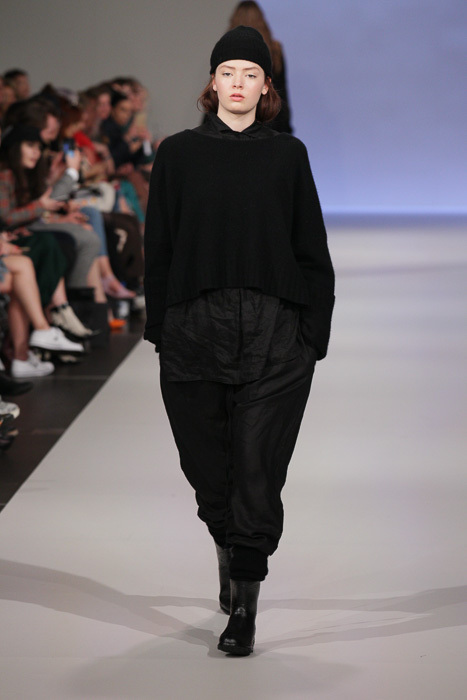 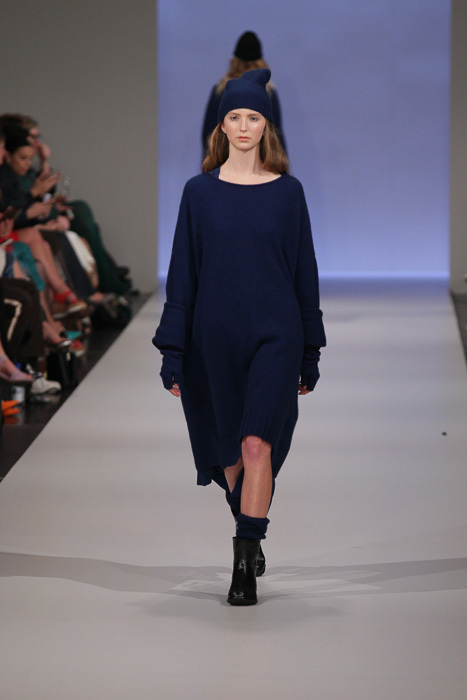 Lela Jacobs showcased bold, oversized knit pieces first in a deep royal blue and then black. 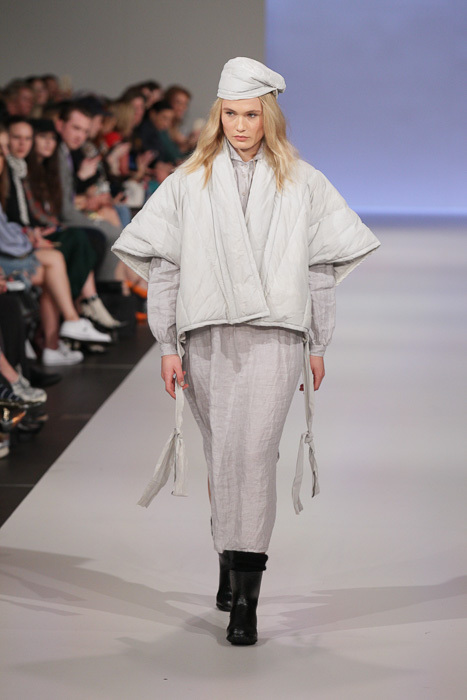 She has a deft touch for contemporary styling and we saw this by way of unexpected layering in her looks. 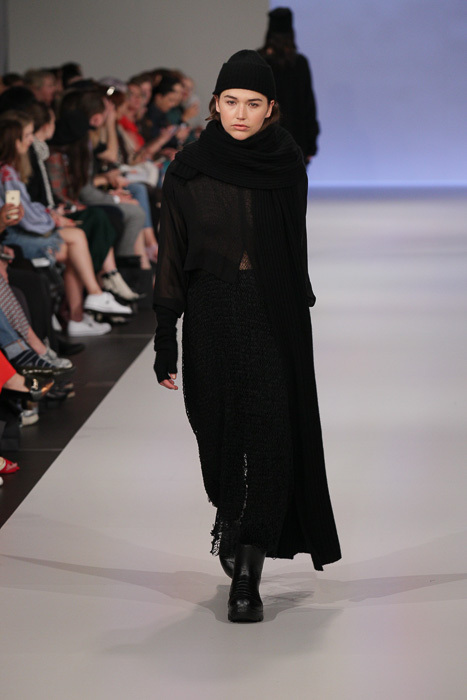 There was a long sleeveless cardigan worn over a sheer shrunken shirt, and an oversized sweater worn over a long sheer dress with the back hem dropped and billowing behind the model as she walked. 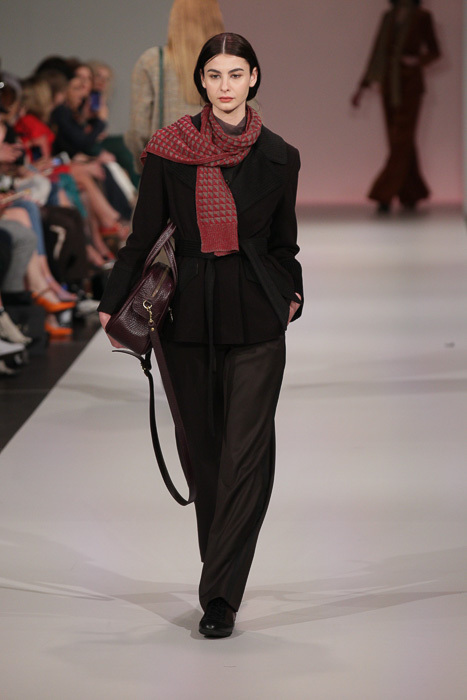 Gloves, beanies and socks and scarves in those same hues were matched with the looks. 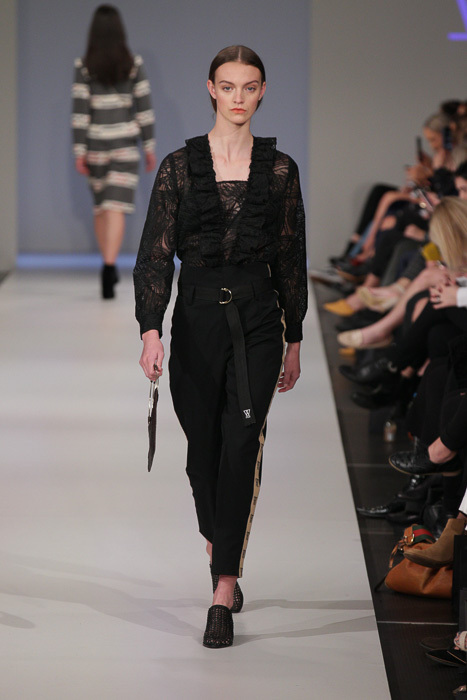 Lela’s models channelled the attitude of her designs well, skulking down the runway with a bold confidence. 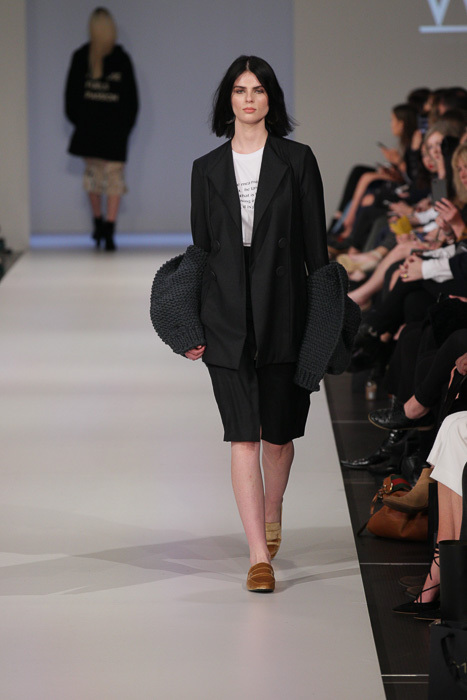 The sisters behind label Wanoa Four have quickly become known for incorporating fashion forward knit designs in their collections since their inception. 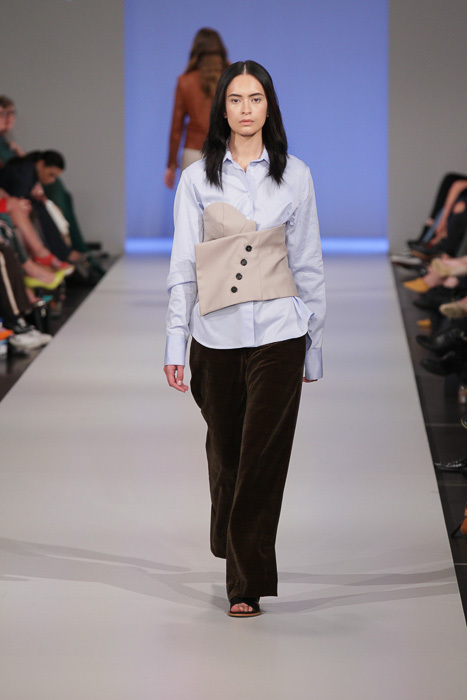 They opened their segment with a slim fit knitted dress with a bold beige and black geometric pattern; this fabric would appear again as a bandeau top. 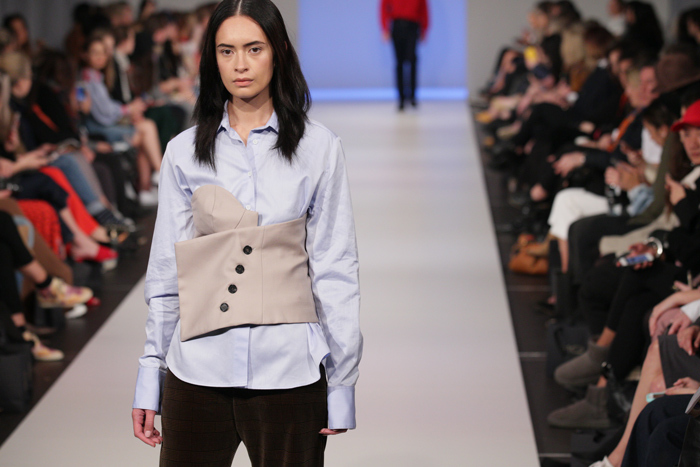 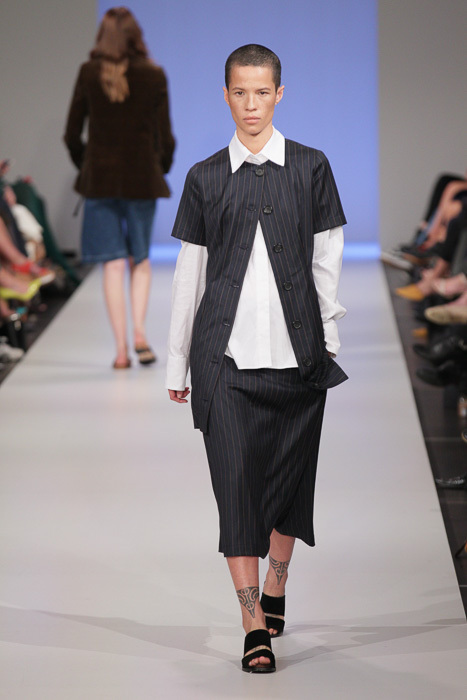 The next look was a silk slip worn with a chunky oatmeal hued cardigan, and it set the tone for their cool and modern aesthetic seen in the rest of their capsule collection. 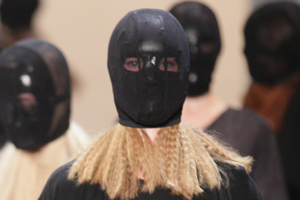 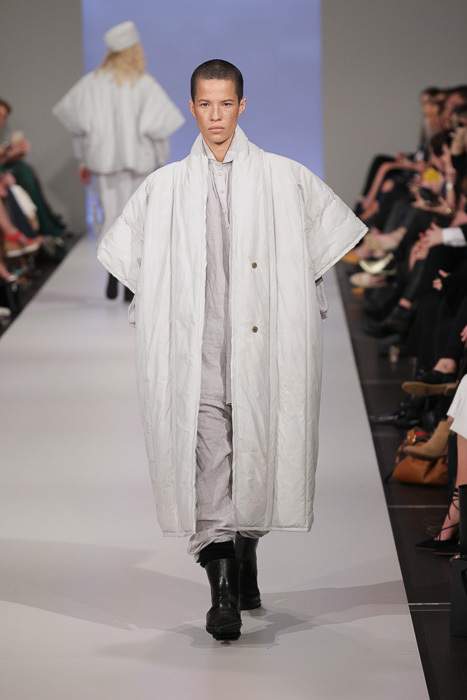 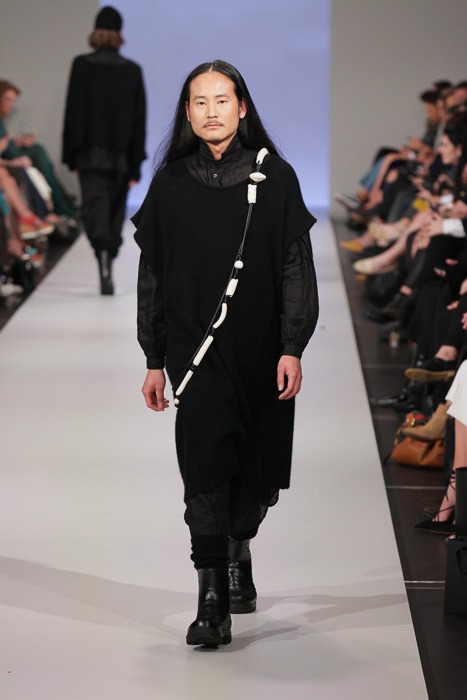 Known for his clever take on merino, Wynn Hamlyn presented a selection of looks as shown last night, though his knit pieces in this show were modelled on males rather than the females as previously seen. 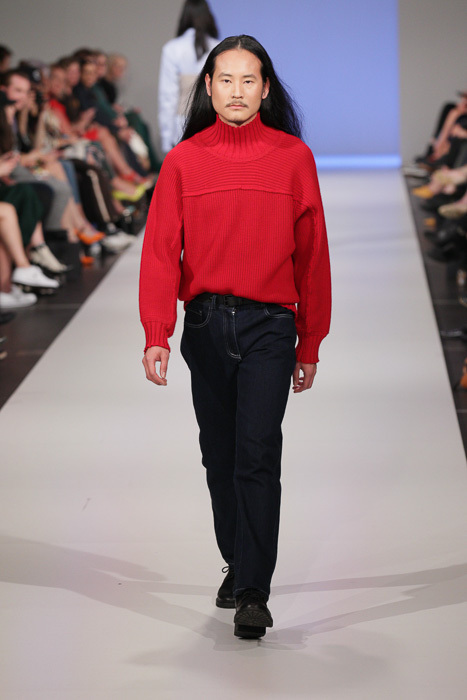 We spotted a striking scarlet red jumper with a turtleneck and dropped shoulders, paired with dark denim jeans. 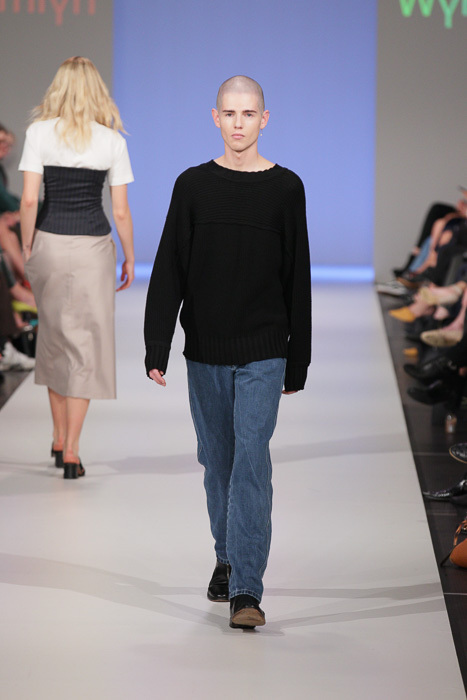 And there was a black crew neck sweater with a raised, chunky rib on the upper panel, again paired with jeans. 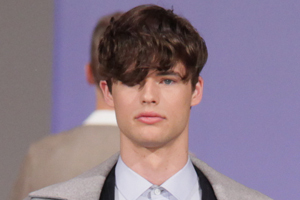 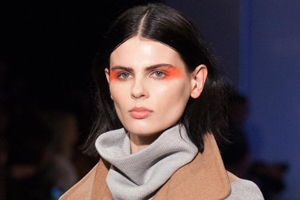 Beauty notes: The models sported effortlessly fresh and natural makeup (though we know, this actually takes a lot of effort to achieve), hair was down and beautifully groomed. 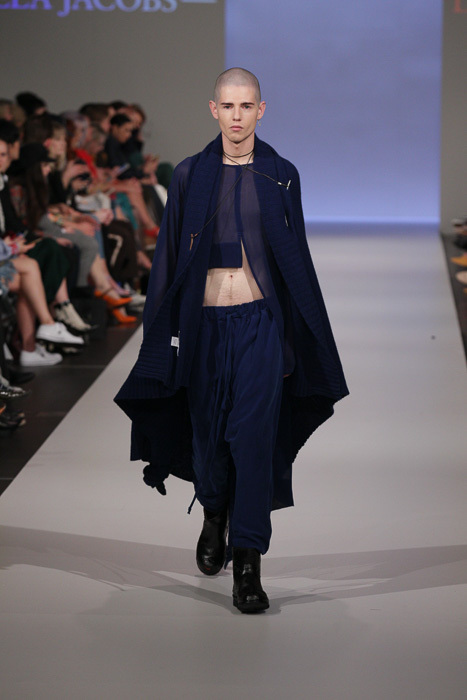 Soundtrack: A group show meant there was an eclectic mix of instrumental, rock, trip hop and PJ Harvey song for good measure.